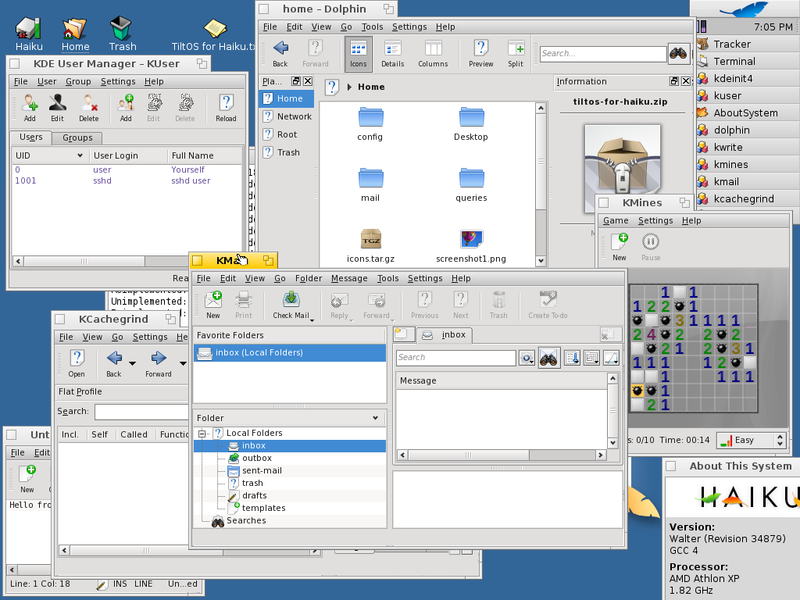 Continuing the theme of "KDE Everywhere", recently it was announced by the folks over at TiltOS that KDE applications are now available for download and use. 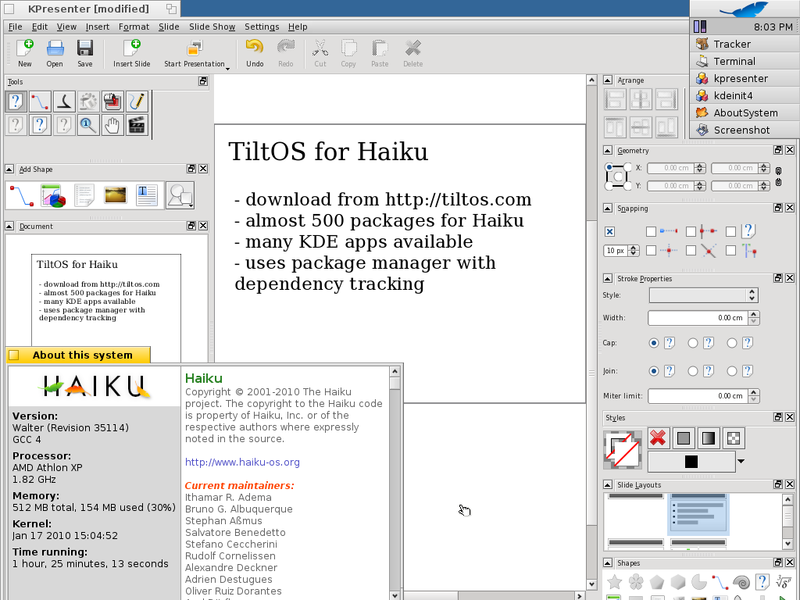 TiltOS provides a repository and an easy to use application manager for the Haiku operating system, which is in turn aims to be an open source implementation of the BeOS operating system. kchmviewer, kdeaccessibility, kdeadmin, kdebase, kdeedu, kdegames, kdegraphics, kdelibs, kdelibs-experimental, kdemultimedia, kdenetwork, kdepim, kdepimlibs, kdepim-runtime, kdesdk, kdetoys, kdeutils, kdevplatform, kdewebdev, kdiff3, koffice and many others packages. In all there are about 150 applications ready to run. As reported in the announcement, this is all possible thanks to the Qt port for Haiku. KDE continues to grow into more devices and onto more operating systems all the time. And now, users of this operating system can enjoy the KDE as well. And hopefully also become an important part of the growing KDE Community! I don't know about the rest of you, but the screenshots look great! I mean, I first saw these while some presentation was going on at Camp KDE, and couldn't resist passing my laptop around to ensure that everyone got a look. I thought the same. I read an article about 10 alternative operating systems that the most people never heard of and Haiku was one of them. It was the only one that I thought that I would try. I downloaded the iso and I will be installing it on an old machine. I am just curious and yes it looks great with the KDE apps. I think it is important that we try to preserve the alternative OS's in use. Even that Linux is great OS, we need to try to make use cases for GNU's own operating system Hurd or all four of the BSD OS's and all these other OS's. This way we can keep choices of future open. 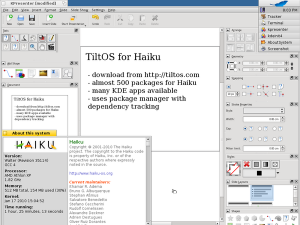 It is great to see that KDE now also runs on Haiku, giving this operating system much needed software applications. Instead, Haiku has a single focus on personal computing and is driven by a unified vision for the whole OS. That, we believe, enables Haiku to provide a leaner, cleaner and more efficient system capable of providing a better user experience that is simple and uniform throughout." Porting Qt and Gtk/X11 to Haiku to get sufficient software kinda violates their own manifest.. Please do keep in mind that both the Qt and KDE ports to Haiku are 3rd party projects, not coming officially from Haiku or Nokia (or KDE for that matter). So while core Haiku development has adopted that philosophy, I don't think they are prohibiting anyone from doing something like this (there aren't any violent or negative reactions on http://www.haiku-os.org/community/forum/qt_haiku for example).